We’ve all heard the old saying “busy as a beaver”. The fact is, beavers (Castor canadensis) really do keep busy, especially at night. In fact, beavers are so industrious, a lone beaver is capable of felling an 8-foot tree in 5 minutes. Beavers are the lumberjacks of the rodent world. They use their tree-chopping skills to gather wood for constructing lodges and dams, and in the process, eat or gather tree bark for food storage. They prefer softwoods including aspen, cottonwood, willow and dogwood, but will also gnaw on hardwoods to sharpen their continuously growing teeth. A beaver will quickly chip away at a tree trunk, winding his way around the tree until it is ready to fall. According to the Adirondack Ecological Center, one beaver can remove about 140 chips of wood from a tree 5 1/2 inches in diameter, toppling it in mere minutes. A beaver is specially equipped to rapidly chop down trees and branches. His dark orange incisors are softer and wear down more quickly on the back than the front, resulting in beveled teeth that are ideal for slicing through wood and stripping away bark. His wide, flat tail supports his short, broad body while he goes about his task. And, his lips are located behind his large teeth so his mouth stays conveniently closed while chiseling wood and peeling bark. A beaver’s hard work felling trees and building protective lodges and dams will substantially alter the environment in which he makes his home. A beaver colony can cause destruction and economic loss. Many people consider them a nuisance. When beavers take up residence near a neighborhood, they can quickly remove or injure expensive planted trees or cause flood-related damage. 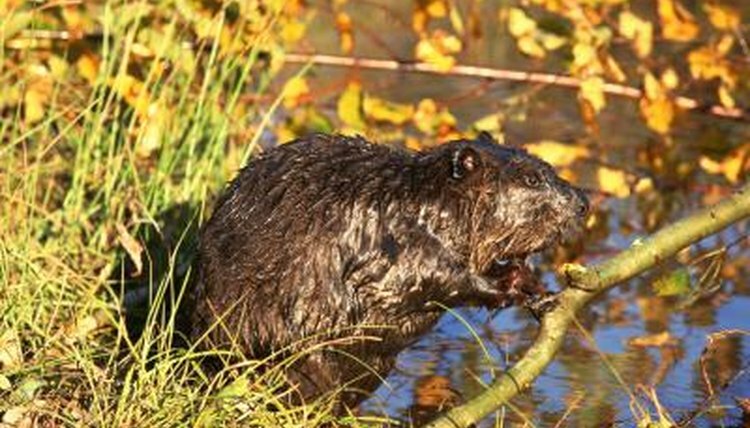 However, the land modifications beavers make assist the environment by creating habitat for a wide range of wildlife, such as muskrat, birds, fish, frogs, insects and turtles. Beaver dams create a source for growing water vegetation such as lilies and cattails. According to the Beavers: Wetlands and Wildlife website, because their dams keep water on land for longer periods of time, beavers help create wetlands that reduce droughts, floods and soil erosion. Beavers even help keep water cleaner when silt collects above older dams and microbes in beaver wetlands break down toxic elements in water. A metropolitan Washington, D.C. resident, Bridget Cipollini has been writing professionally for more than 15 years. She received a Bachelor of Arts in journalism from Indiana University of Pennsylvania in 1986. She is a passionate advocate for animals and has volunteered for pet rescue and adoption organizations. What Do Beavers Feed Their Kids? What Does a Muskrat's Teeth Look Like? What Does a Beaver Eat?